Dr. Sanjay K. Singh is Professor in the Business Environment Area at the Indian Institute of Management Lucknow. He holds a Ph.D. degree in Development Studies from Indira Gandhi Institute of Development Research Mumbai. Dr. Singh started his academic career as Member of Faculty & Coordinator of Centre for Transport Policy and Economics at Central Institute of Road Transport, Pune in February 2001. He joined XLRI Jamshedpur as Assistant Professor in October 2003. In December 2003, he moved to IIT Kanpur in the Department of Humanities & Social Sciences and worked there as Assistant Professor till February 2008. 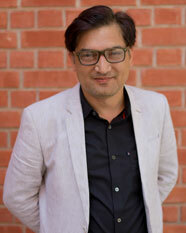 He joined IIM Lucknow in February 2008 as Associate Professor. He became full Professor at IIM Lucknow in December 2013. Dr. Singh has published two books and more than fifty research papers in reputed journals. His papers have been published in such journals as Transport Policy, International Journal of Transport Economics, International Journal of Society Systems Science, European Journal of Transport and Infrastructure Research, Journal of Public Transportation, European Transport \ Trasporti Europei, Transportation Research Record, Urban Transport Journal, Telecommunications Policy, IEEE Transactions on Power Systems, International Journal of Emerging Electric Power Systems, Electric Power Systems Research, Applied Soft Computing, Economic and Political Weekly, Studies in Business and Economics, and Productivity. His Scholar.Google h-index is 14 and i-20 index is 13. His research interests are in the areas of Transport Economics and Policy, Infrastructure, Industrial Organization, and Regulatory Economics. His teaching interests are in the areas of Industrial Economics, Managerial Economics, Macroeconomic Environment, and Economics of Regulation. Dr. Singh is recipient of the NASI-Scopus Young Scientist Award in the area of social sciences for the year 2014. He is also the recipient of the Manas Chatterji Award for Excellence in Research in Regional Science for the year 2006. He was listed in the Marquis Who's Who in the World 2011. His very first research paper was awarded as the Best Article of the Year 2000 by the ASRTU. On December 19, 2015, he received the Venus International Foundation Outstanding Scientist Award for the contribution and achievement in the field of Development Studies.